Materials - ZT | Zippertubing Co.
Zippertubing® has developed an extensive line of thermal protection products primarily designed to function as heat shields; the materials are also an effective barrier against most oils, grease, brake fluids, fuels and many low percentage acids or caustic liquids. Many ZZippertubing® thermal barrier products can be seen in automobiles, trucks and buses assembled by leading American and European Automobile Manufacturers. Zippertubing® offers unique cable management solutions for a variety of applications. Our wrap-around product lines afford you the opportunity to add additional abrasion protection, chemical resistance, even EMI shielding to your cable bundle without the need to disconnect your cable assembly. Additionally, Zippertubing's products provide a CLOSED SYSTEM, which insures no dirt, debris, sand or other foreign objects will penetrate into the cable bundle and damage the individual wires within your harness. We have been providing complete cable management solutions for applications in the aerospace, automotive, commercial electronics, communications, military and transportation markets since 1957. Zippertubing® offers a broad range of high-tech Extruded Films that include materials optimized for specific needs, such as high dielectric strength, resistance to abrasion or various environmental and/or chemical hazards while exhibiting unusually high flexibility. Many of our extruded films may be configured for round, flat or rectangular cable. Zippertubing® offers a comprehensive variety of Coated Fabric materials which provide resistance to temperature and weather extremes, mildew, particulates as well as providing abrasion protection to electrical wires and cables. Our high tenacity weaves are coated with various polymers to provide outstanding performance under almost any condition. Choose from Polyvinylchloride, Polyurethane, Silicone and Teflon coated materials. Coated Fabrics can be configured for round, flat and rectangular cables. 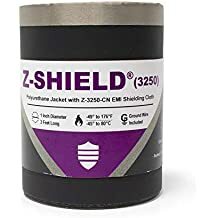 These materials can also be combined with Zippertubing's EMI Shield materials. Our foil EMI shielding can be combined with most of our jacket products and closures to create an EMI Shielding harness that provides outstanding performance and durability. We offer two variations of foil shielding, our SH1-63 laminate and our SH1-Mylar laminate. Zippertubing® offers a comprehensive range of simple, operable closures used for assembly and re-entry to the wire harness for future repair or modification. Our vast array of closure mechanisms are designed to be cost effective and compatible with most of our Zippertubing® jacket products for a wide range of applications and industrial markets. 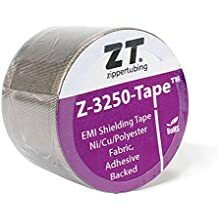 Zippertubing® adhesive tapes are strong, flexible and offer an easy installation process. Adhesives are best used on applications that do not require the need to be reworked or re-entered. Our various adhesive strengths and tape characteristics offer a full range of closure and laminating capabilities and options. Hook and Loop closures consist of dissimilar woven tapes comprised of synthetic hook filaments on one side and loop fibers on the other. The construction allows for numerous fastening and unfastening of the jacket for re-entry, repairing and resealing. Primary use for hook and loop is applications where frequent accessibility is needed or complete removal of the product after the initial installation. Sleeving closures are mechanically sewn tubing used to pull over a cable bundle. This closure is most commonly used with round and flat cable configurations and short assembly run length applications. Snap Fastener closures are cost effective, re-enterable jacket closure systems for cable management and high performance heat barrier applications. Snap closures require no tools and minimal training. Zippertubing® pressure tracks are formed from PVC, Polyurethane, FEP and other extruded materials into convenient and reliable interlocking closures. The various closure options provide a broad performance range and can be combined with most of our materials utilizing heat sealing and sewing techniques. Some of our tracks are designed to be used in conjunction with pliers or a slider tool for faster installation procedure and larger applications. A halogen-free, flame-retardant, thermoplastic polyurethane extruded arrowhead-and-channel interlock system. The zipper closure consists of two separating woven fabric tapes each containing a series of interlocking teeth that mesh together when closed by a self contained slider mechanism. Zippertubing® offers a multitude of options for both wire terminals and ground wires. These options fit any custom-engineered solution and can be built in conjunction with one another. Utilizing more than one option simultaneously will help meet the specific needs of your application. Normally located at the end of a conductor originating from your electrical components, wire terminals can also provide an additional connection point for other external circuits. Ground wires normally allow an electrical connection or transfer of the electromagnetic interference (EMI) from the component to a grounded connector. Zippertubing® offers many different gauges of ground wires to meet the needs of your application. Braided ground wires normally allow an electrical connection or transfer of the electromagnetic interference (EMI) from the component to a grounded connector. Zippertubing® offers many different gauges of ground wires to meet the needs of your application.